Earlier this month we took a family vacation to Winnipeg, Manitoba. My husband had a conference there, so we decided to tag along and make a trip of it. Now you might think it’s odd to take a vacation to Winnipeg, but what you don’t know is that it’s a really family-friendly city and there are lots of fun things to do in Winnipeg. The reason I know this is because we lived in Winnipeg for 6 years and got to know the city pretty well. On this trip, we revisited some of our favourite places and had such a good time that I wanted to tell you about it. In case you are every headed in that direction, it’s definitely worth a stop and visit for these family-friendly things to do in Winnipeg. This was one of our favourite places to visit while we lived in Winnipeg and we actually bought an annual membership because we went so often. It’s a wonderful place for kids to have fun, be active, learn and spark their imagination. The exhibits include an actual train, a splash water lab, arts and crafts, a tumble zone to build skyscrapers and so much more. There are also traveling exhibits to peak the interests of kids and adults alike, changing on a regular basis. We had so much fun, that we actually went twice during our trip. The Forks is one of the best parts of Winnipeg for both visitors and residents. It’s like a mini Granville Island for those of you from Vancouver. It boasts a market, local vendors and restaurants, a river, activities, live music, park, spray park, trails, you name it, it’s there. It’s a lot of fun for the whole family. 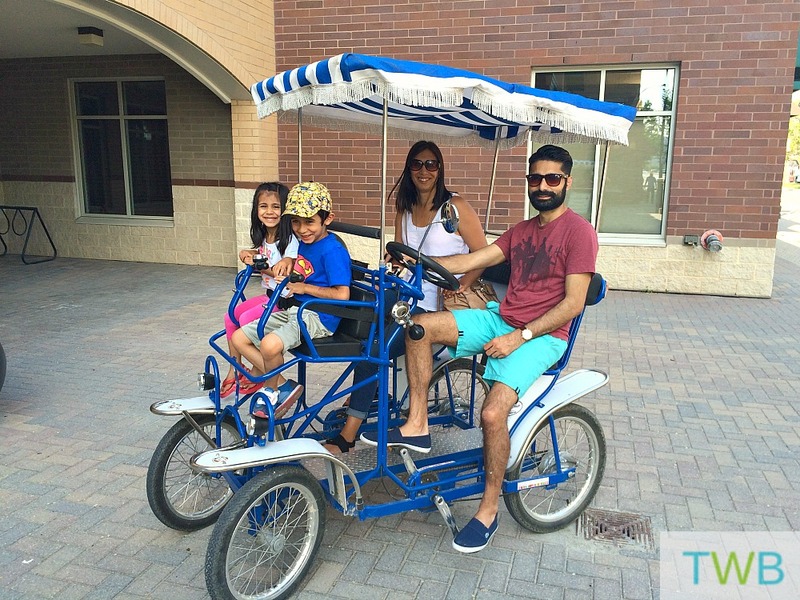 This time we rented a family bike and it was one of the highlights of our many trips to The Forks. 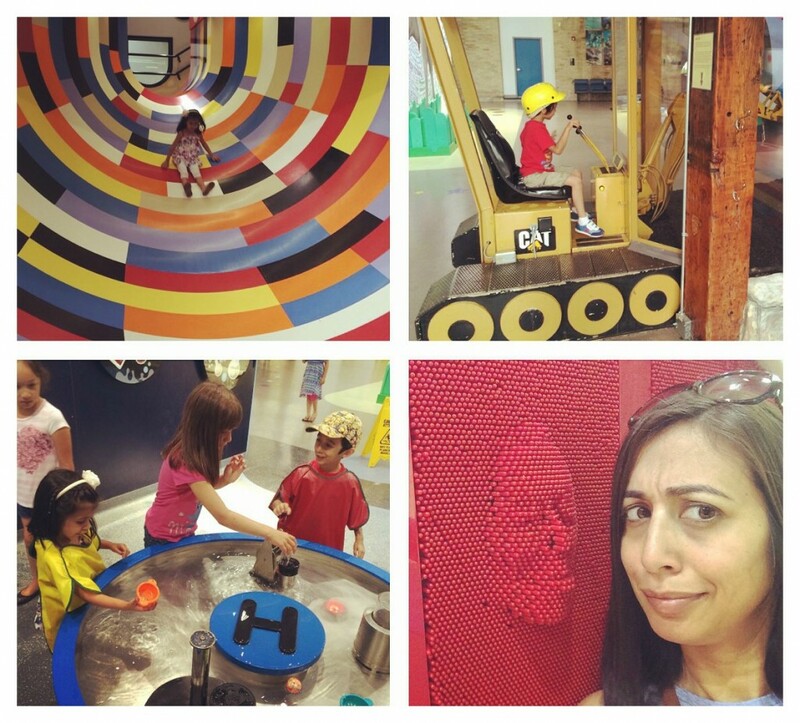 We didn’t get to visit it on this trip, but Kid City is a fun indoor activity for the kids. It’s a huge play centre for toddlers to age 12, with something for everyone. The zoo is a year-round attraction in Winnipeg. Since we left Winnipeg in January 2013, it has undergone a big renovation and we had a great visit. What I was looking forward to the most was going though the Journey to Churchill. 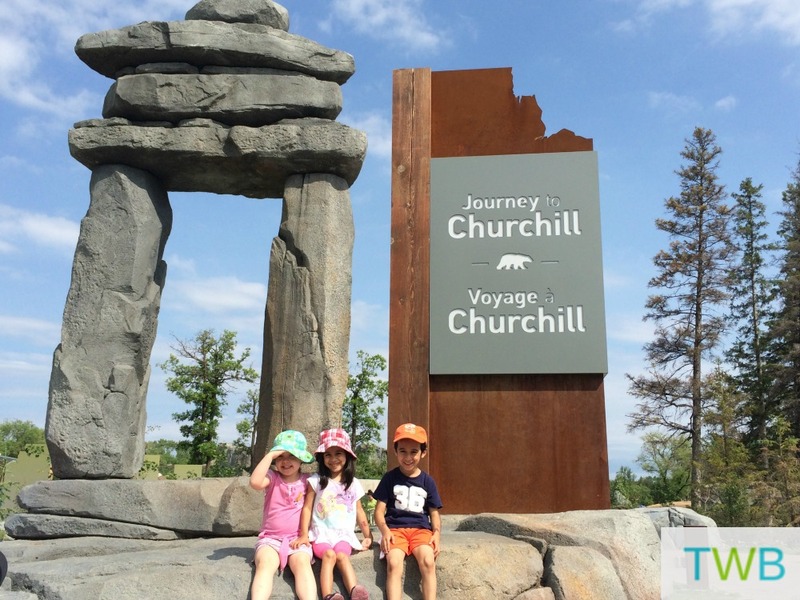 This 10 acre exhibit was designed to recreate the terrain found in Churchill, Manitoba, one of the few human settlements where polar bears can still be observed in the wild. 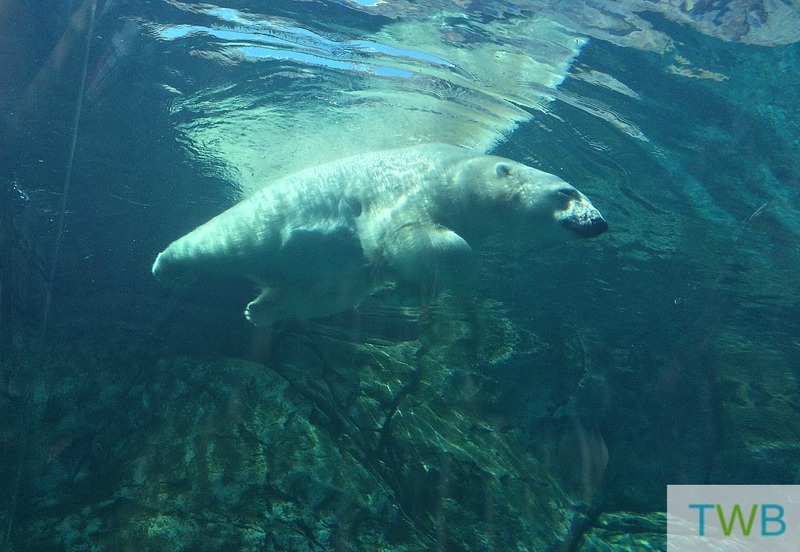 Along with the polar bears in the exhibit (who were orphans,) there are wolves, seals, moose and muskox. Kid’s love playgrounds and in my opinion, this is one of the best and most unique playgrounds we have ever been too. 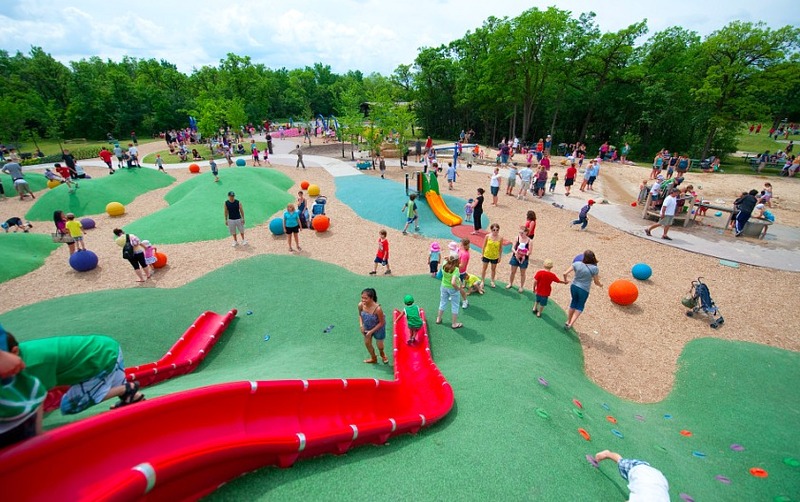 Located close to the Assiniboine Zoo, it has large slides, saucer swings, a sand and water area, a rope climbing structure and so many areas where nature is combined with play. We couldn’t visit Winnipeg without stopping at the playground and the kids had a blast! As soon as the warm weather hits, Winnipeg’s countless spray parks turn on and this leads to a ton of fun for families and kids. Although there are many spray parks all around the city, we only had a chance to visit the one at the Forks. It was so much fun and a great way to beat the heat. This museum was still under construction when we moved to Vancouver. We knew that it going to be an important experience so it was on our must-do list for our trip. The museum opened in September 2014 with a price tag of $351 million dollars. 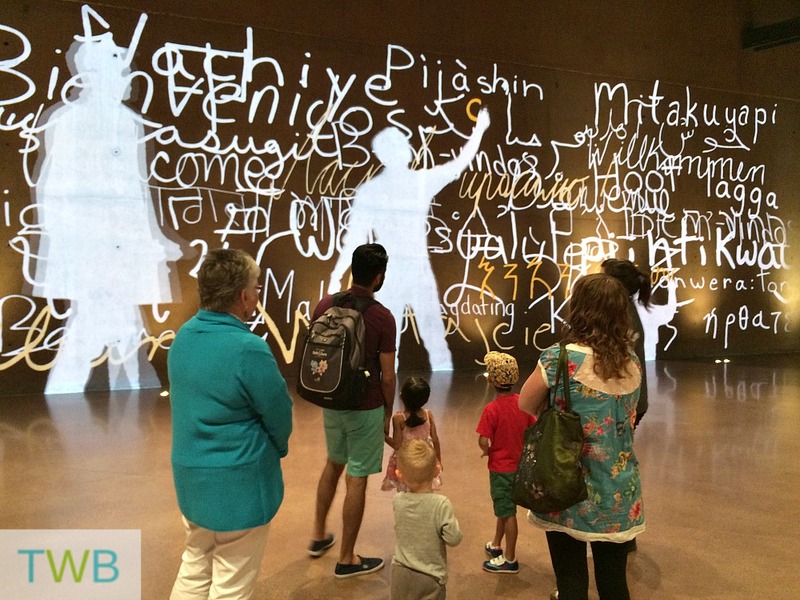 It was built to explore the human rights on a national and global scale, in the past, present and future. We were greeted with the word ‘Hello’ in 36 different languages. When we visited the museum, we got to take a special tour that was toddler-friendly. The experience was definitely amazing and touched the heart and soul. We finished off with a ride to the top of the building, the Tower of Hope. This is the final leg of the tour so that people can leave the museum not feeling sad or upset but rather be filled with hope for a better future for human rights. For the kids, one of the highlights was our Splash Dash Boat Ride Tour around Winnipeg on the river. Of course it’s always fun to ride in a boat. In addition to that, we got to revisit some of the sites and landmarks of the city in our half hour tour that started at the Forks. We have so many great memories from our last visit to Tinkertown amusement park and we would have loved to go again, but we were a bit too early in the season and it wasn’t open yet. From what we remember, there were lots of fun rides for the kids (and adults,) even for the little one that often don’t meet the height requirement in other parks. We will just have to put it on the list for next time. And of course a trip to Winnipeg is not complete without a visit to the beach. Yes, that’s right, I said the beach. I was skeptical at first myself but years ago when I made my first trip to Grand Beach, I was astonished at the amazing sand and waters the beach had to offer. This time around it was the same except we visited Winnipeg Beach. 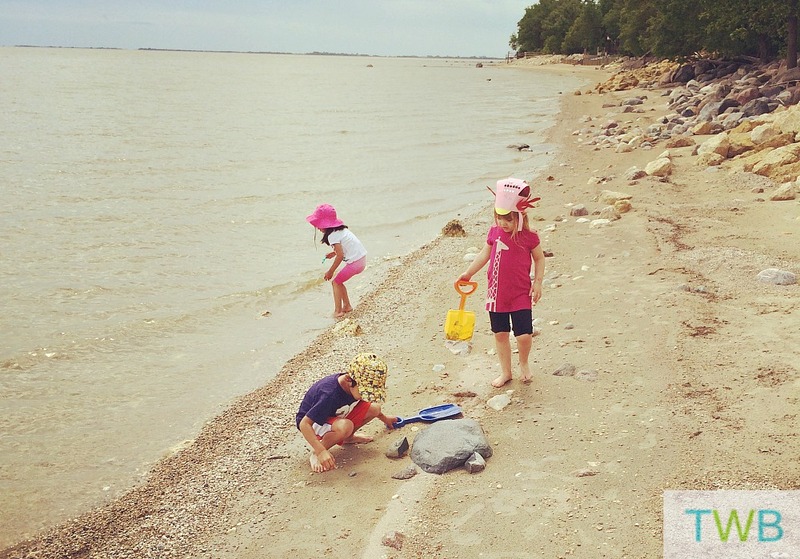 We dug in the sand, splashed in the water, collected seashells, it was almost like we were on a tropical vacation. Believe it or not, I am just scratching the surface of all the great family-friendly things to do in Winnipeg. If you don’t believe it, here is a list from Tourism Winnipeg of 101 Things to do in Winnipeg. Just in case you’re ever headed in that direction, you might want to consider a little detour and have some fun with the family. From all the 10 family-friendly things to do in Winnipeg that I listed above, what is one that you would want to visit the most? That’s an impressive list of activities for children. I love the look of the museum. And of course the beach is always a firm favorite with children where their imagination can run free. There really is a lot to do! The museum and beach were a couple of our favourites! You won’t be disappointed when you go for a visit! Who is the blogger? Looks like a lot of Fun, hope you guys had an amazing time! We did Hirra, thank you so much! Narcisse Snake Dens is always a hit with my kids, and it’s free. It’s a couple hour drive out of winnipeg. Check out their website for details. I haven’t heard of that Richelle, I’ll have to look into it next time, thanks. I’m so glad you were able to pop by, and what more? A visit with me! So humbled to have met you and I absolutely think you need to return…but maybe we fit in a spa date? You had a busy vacation! I was really glad too! And yes, a spa date sounds divine. Thanks a lot for this list. Although I know of some, I am a new mom and there were things on here I had never heard or thought of! I was looking for some places to take my 7 mo. old while we are in Winnipeg next week. Could definitely try splash parks and maybe the nature playground. Thanks again! I’m so glad you found it helpful and I hope you had a wonderful time in Winnipeg! !